There’s been a lot of news lately about how physical retail stores in North America are losing the battle with the online world. 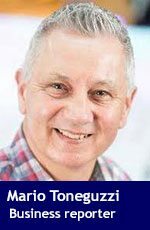 And there’s no doubt e-commerce, particularly online sites like eBay and Amazon, have lured many shoppers to that platform. “More Albertans are starting to scour the web for the best deals on toilet paper, vacations and even food,” says ATB Financial’s Economics and Research Team in its The Owl commentary. “Calgarians do more online shopping than Edmontonians. According to data from Numeris, a polling firm that focuses on consumer behaviour and media consumption, 76 per cent of Calgarians over the age of 18 made a purchase online in the past year. In Alberta’s capital city, only 68 per cent of people aged 18 or over opted to buy something this way,” says ATB. ATB says travel was the second most popular category among online shoppers in Calgary and Edmonton. In Edmonton, 23 per cent booked travel through a travel site with 22 per cent in Calgary doing the same. Also, 19 per cent of adults in Calgary and 14 per cent of adults in Edmonton bought flights directly from an airline’s site. “Online music and movies was the next most popular category. One in five Calgarians paid for or purchased and downloaded music and movies online in the last year. 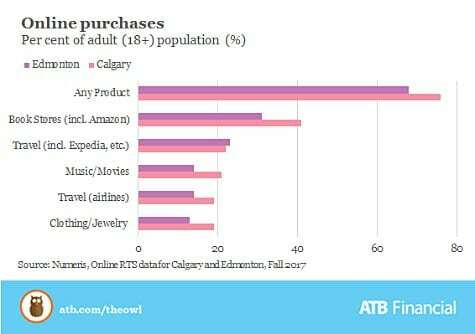 Edmonton’s activity in this category was lower, with only 14 per cent of adults buying music and movies online,” says ATB.